Mountainbike (MTB) sports is still a young and developing sports, compared to road cycling. No studies investigating 1-day MTB marathon races or MTB stage races have yet been published. Just as the Tour de France is the ultimate multiple day event for professional road cyclists, so the Transalp Challenge (TAC) is one of the most difficult MTB stage races in the world. Therefore, the author aimed to investigate the TAC for the first time. This study was the first ever to i) study an extreme MTB stage race, ii) determine the exercise intensity during one of the most important MTB stage races in the world, iii) detect acute effects and long term adaptations, iv) study a female athlete during this severe multi-day MTB marathon race and v) report the (vegan) dietary intake during the TAC 2004. The current findings might be useful to design specific training programs and to develop appropriate nutritional strategies to sustain the physical demands of severe MTB marathon and MTB stage races. Katharina C. Wirnitzer, Dr. rer. nat. 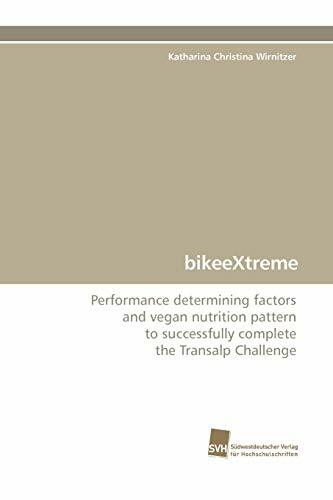 : Study of Sport Science at the University of Innsbruck/Austria, with the main focus on the Transalp Challenge (completed twice by herself), including performance determining factors and vegan nutrition during this mountainbike stage race (www.bikeeXtreme.org), graduated as Doctor of Science in April 2009.